David, the founder of the Poor Man’s Ministry, contacted us a few weeks ago asking about website design and what was required to have a website. David also has a full-time job and didn’t have a lot of time to work on the site, nor much of a budget. 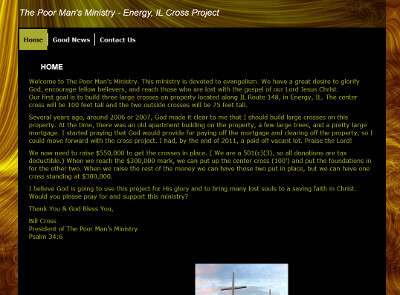 His ministry is taking on a project in Energy, IL where they are attempting to raise funds for the building of three crosses on some property. Therefore, he needed to have a website that explained what they were doing and the ability to potentially raise funds from the site. Upon receiving the needed items from David, we started work on the site and got it done within a couple of days. Since then, he has been quite busy and would usually contact us on the weekends for any other changes or updates. David has approved of the site and noted that he may have us make some changes later on. We appreciate the business from the Poor Man’s Ministry! David’s website is at energycross.org.